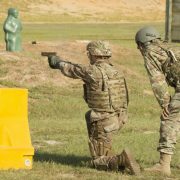 The US Army’s roll out of the new M17 Modular Handgun System continues with the US Army Military Police School among the latest units to recieve the new SIG Sauer-made pistols. The US Army Training and Doctrine Command have posted an article announcing the Military Police School’s transition and getting some reactions from those now […] Read More … The post Modular Handgun System Roll-Out Reaches US Army Military Police School appeared first on The Firearm Blog. SIG Sauer have announced that Orlando Police Department have selected their SIG Sauer Virtus Patrol Rifle. 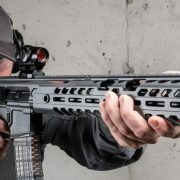 The modular SIG Virtus weighs just under 8 lbs and is available in 5.56x45mm and .300 BLK with a 16-inch barrel and a choice of buttstocks. According to local news reports, the Orlando Police Department, which has more than 700 […] Read More … The post Orlando PD Select SIG Sauer’s Virtus Rifle appeared first on The Firearm Blog. 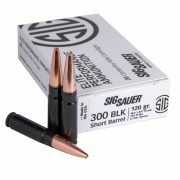 SIG Sauer have announced the introduction of a new 120 grain supersonic .300 Blackout round for their Elite Performance range. SIG Sauer describe the new round as a duty round optimized for SBRs with sub-9 inch barrels. The new round uses an all copper bullet in a black oxide case. Here’s SIG’s press release on […] Read More … The post SIG SAUER Introduce NEW 120gr Supersonic 300BLK SBR Elite Copper Duty Ammunition for Short Barrel Rifles appeared first on The Firearm Blog.